Our flat bottom "shopper" bag advertises a High-End feel for anything from upscale eating, family friendly restaurants, retail shops or small boutiques. 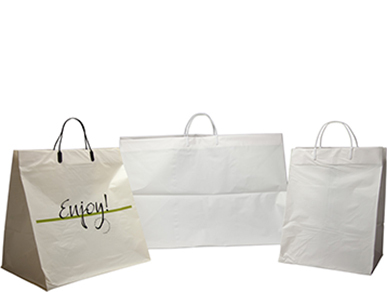 These bags are in stock in either white or ivory semi-opaque film with a chipboard insert in the bottom of the bag. Leak-proof! Rigid handle bags hold up where flimsy paper bags don't. Chipboard inserts provide added strength & stability. Huge area for artwork and graphics to make these bags your own. Front or back printing is available. Be sure to ask your sales rep.